Bathroom sinks can make or break the design of a bathroom. They are the focal point which is why it is important to choose one that best represents the style you want to create. Whether it is traditional or modern, eclectic or tame, there are many to choose from. Here are three types of popular bathroom sinks and what they are best used for. Pedestal sinks are unique in that they convey an image of both a vintage home and a modern home. They are perfect if you have a small space and are often found in powder rooms. There are many designs to choose from for the pedestal, and something for all décor choices. Pedestal sinks usually have their plumbing concealed within the pedestal, although because there is some space between the pedestal and the wall, some plumbing will be exposed. This can result in a bit of a choice when it comes to decorating. Sometimes the same paint color is used from the wall to paint over any exposed pipes, to try to blend everything in together. Other times the pipes are left exposed as a more industrial look. Cabinet vanities and bathroom sinks are the most popular option, and within this category there are a lot of options. Sinks can be drop-in or where the rim sits on top of the counter. They can also be undermounted, where the rim sits under the counter for a more modern look. Sinks can also sit atop cabinets as either a glass or ceramic vessel. The biggest benefit of cabinet bathroom sinks is that they offer storage underneath. This is great for families that need extra storage, and can even take the place of a linen closet. Most cabinets are built attached to the wall, but if you want more modern design, there are many pre-built cabinets that can be purchased and assembled in your bathroom. There is perhaps nothing more modern than a wall-mounted sink. Its beauty is in its simplicity. Seemingly jutting out from nowhere, wall-mounted sinks force you to remove all clutter. They can be thick or thin, and the taps can be of any choosing. What is especially nice about wall-mounted sinks is that their plumbing is minimal. 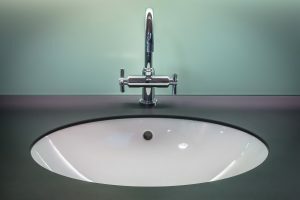 While there still needs a pipe for the water to flow, unlike cabinet sinks, wall-mounted sinks include a pip that is about function as well as design. Instead of typical plastic, the pipe is often made of metal. And as a design bonus, the finish of the pipe should match the finish of the tap. Therefore, if you have a brushed nickel tap, you should also have a brushed nickel pipe. Wall-mounted sinks are definitely not for everyone. There is absolutely no storage space, so they are not a great idea for families. It can also be hard to retro-fit them in an existing bathroom, and are best built in new homes.